We always have extra boxes coming into the house, mostly as shipping boxes, and the kids are always finding creative ways to reuse them. They have such great imaginations! 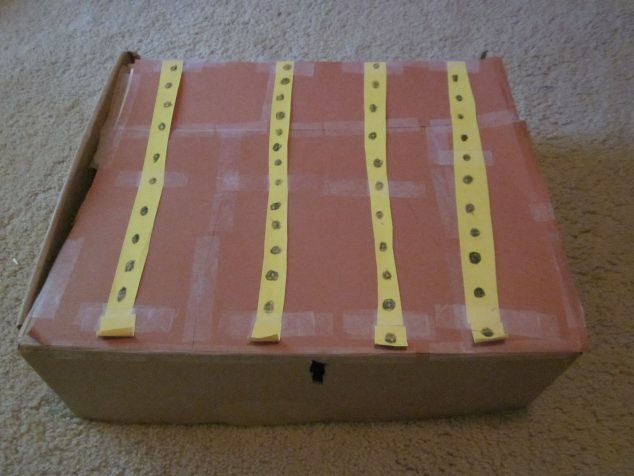 So I decided to put together a list of fun cardboard boxes crafts to help jump start your creativity motor and get you and your kids building something fun with cardboard boxes. 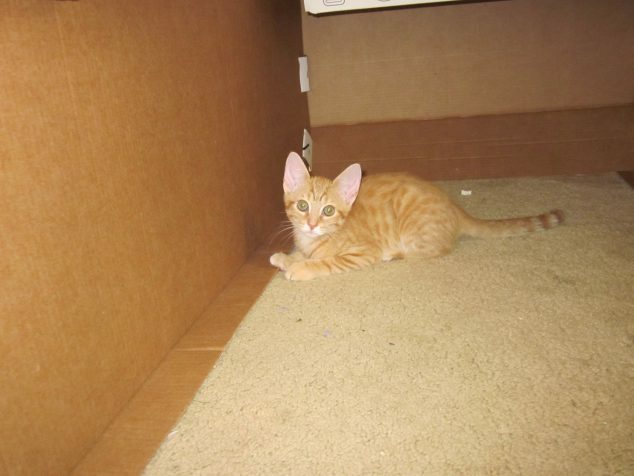 It seems like kids and cats just love boxes! Boxes of all sizes can be turned into all kinds of fun and it is a perfect indoor activity when there is poor weather. If you give them access to boxes, kids seem to get all kinds of wild ideas! You can also help stimulate the creative juices by providing some crafting supplies such as markers, crayons, masking tape, scissors (with supervision), yarn, and scrap paper, that they can use to decorate and make things even more exciting! Not only do boxes give your child a cheap or free medium to create with, it also teaches them something about planning, decorating, and building. 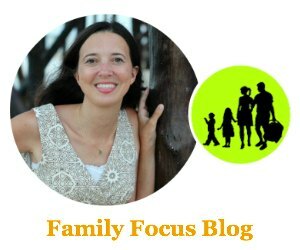 You might want to let your kids run free and build whatever cardboard boxes crafts they like or you might want to jump in and help them for some real family fun! A box can be turned into a fabulous doll house. Cut out windows and doors, craft a room and you can even make cardboard furniture. Once you do that, you can get even more creative. 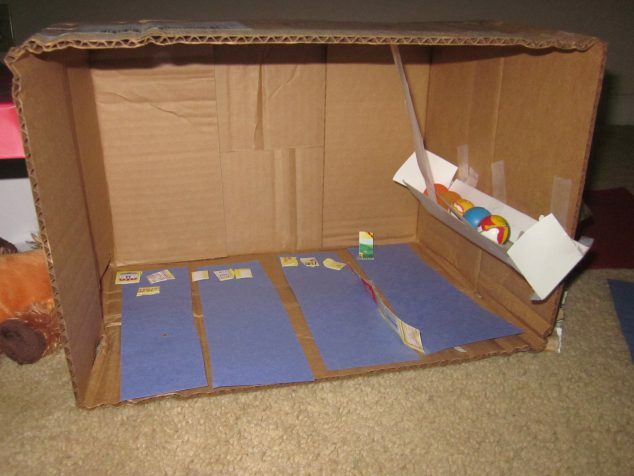 Above, my kids made a bowling alley for their dolls complete with a bouncy ball return! My daughter made this treasure chest to store her jewelry crafts and other things. She even made a key hole and insists that it is looked and we must not open it! 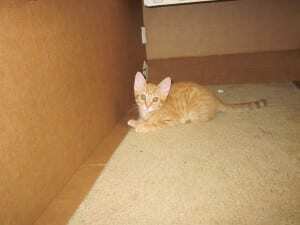 Even cats love cardboard boxes and my kids love pretending this big box is the cat’s house. He doesn’t seem to mind. I don’t know where my kids get these crazy ideas but here they came up with a stuffed animal hotel. They put together a bunch of small boxes to make this hotel so that each stuffed animal would have his own room. Once we use a refrigerator box to make an ice cream truck and paint to decorate it and sell each other play dough ice cream out of the side. Shoe boxes can be covered with wrapping paper for super cute storage boxes to hold things like hats, mittens, and scarfs in the closet or things like hair bows on the counter. 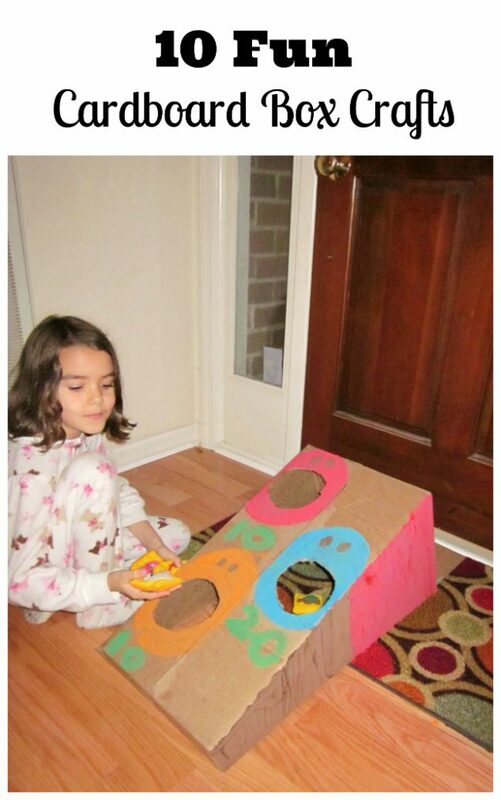 These family fun cardboard boxes crafts are a great way to reuse boxes and then when you have gotten bored of your creations you can always reuse them again to build something new or bring them to the recycling center. 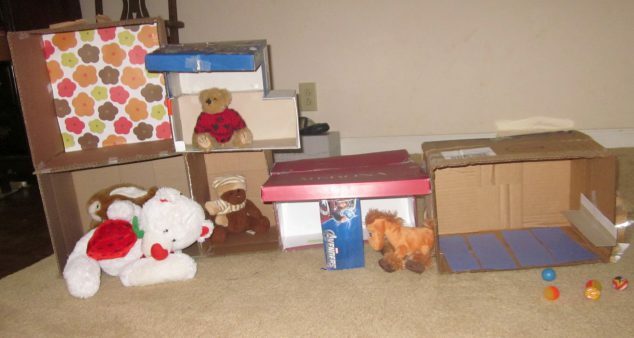 What have you and/or your kids had fun building out of boxes? Boxes really make awesome toys! I Love the bowling alley and the ball return on the side is so darling!! My son made a mask one time out of a box that he could fit over his head. He cut out holes for the eyes and drew the fact and then glued string on the top for hair.